While the Canadian economy is returning to form since the financial crisis in 2008, many people have turned to self-employment. With self-employment, you save money on transportation in some cases, choose your own hours and work without a boss monitoring your daily activities. But just as you needed an office as an employee, you’ll need one for your own business. The good news is the Canada Revenue Agency lets you claim your home office on your taxes. Be sure to follow the rules, otherwise your tax claim could be denied. 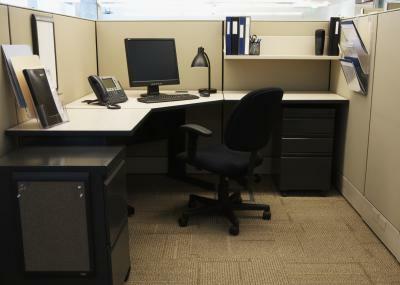 Trading in your cubicle at work for a home office means possible tax deductions. If you’re self-employed, you can claim your home office under two conditions: 1) The workspace must be your principal place of business or used exclusively for the purpose of earning income from business. 2) The space must be used on a regular and continuous basis for meeting clients, customers or patients. It’s important to be realistic when claiming the size of your home office. One of the most common audit triggers is claiming inflated home office expenses. If your home office qualifies for the tax deduction, you can claim a portion of your household expenses. For example, if your home office takes up 10 percent of the square footage of your home, you can claim 10 percent of utilities, insurance, property tax and mortgage interest. You can also deduct expenses related to your home office. Expenses the CRA lets you deduct include pens, pencils, pencils, paper clips, stationery and stamps. Do not deduct calculators, chairs, desks and filing cabinets because these are capital expenses. One often overlooked expense you can claim is cleaning services; if you have a cleaning lady tidy your home office, you can claim that as an expense, too. Two other common tax filing mistakes include: – Rounding up your home office expenses: This may prompt the CRA to take a closer look at your tax return. It also could lead to closer scrutiny for your other expenses. – Failing to break down your home office expenses into different categories: The CRA may question your expenses if you’re showing big numbers in one category. When you’re an employee, there are more restrictions for claiming your home office. You can only claim a home office expense when you’re required to pay for it by your employer; you can’t claim it if your employer reimburses you for it. Your employer must file the proper paperwork by certifying your obligation to use part of your home as an office on Form T2200, Declaration of Conditions of Employment. As well, you can’t make the same tax deductions available to the self-employed. Can I Claim A Tax Credit For CPP Contributions?